One of the first official things we’ve been asked to do as Technology Coaches is to go into every classroom in the elementary (Pre-K through grade 5) and do a short introductory iPad lesson. We met with the Primary Years Programme coordinators and the Elementary iPad Advisory Group (made up of 7 teachers) to create and refine our ideas for our lessons. It was decided that the most important concept before the students received their iPads was how to treat it (where it should/shouldn’t go, how they should/shouldn’t hold it). To get started, we created a sign-up sheet for the teachers in Google Docs. We then sent them an email with the link telling them a little about what we wanted to do and asking them to fill in their information. As a team, the three of us decided to split the grades so that our lessons would be able to be tailored for the target age group. After my two gentlemanly colleagues had chosen, I was left with 3rd grade and half of 2nd. I was a little hesitant and nervous at first as I’ve never worked with students younger than grade 9! I then asked them for their help. I told them how I knew a little boy who needed their help deciding how to treat his iPad. For each drawing (thanks bunches to Matt!! 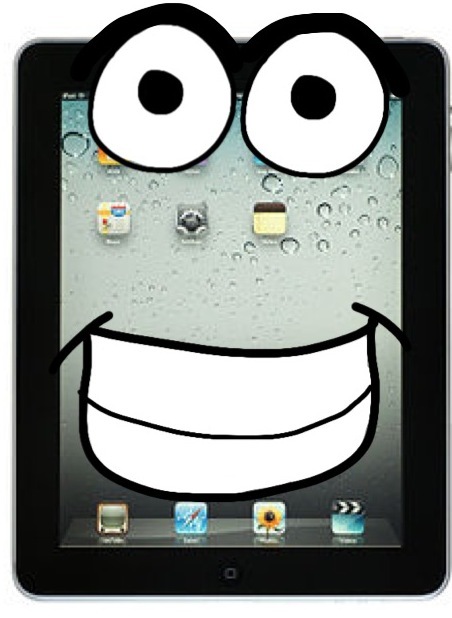 ), they raised their hand if they thought it was a good way or a bad way to treat the iPad. Before showing them the “answer,” I had a couple students share about why they thought it was good or bad. We talked about why it would make the iPad happy or sad and I reiterated to them that I would be sharing their advice with the little boy. Before letting them switch to question mode, the teacher and I steered them towards giving me advice about what should be put in the iPad (only charger, headphones & case), what shouldn’t be put with the iPad in their backpack (no food/drink) and how the iPad should always stay in the keyboard case (unless a teacher tells them differently). 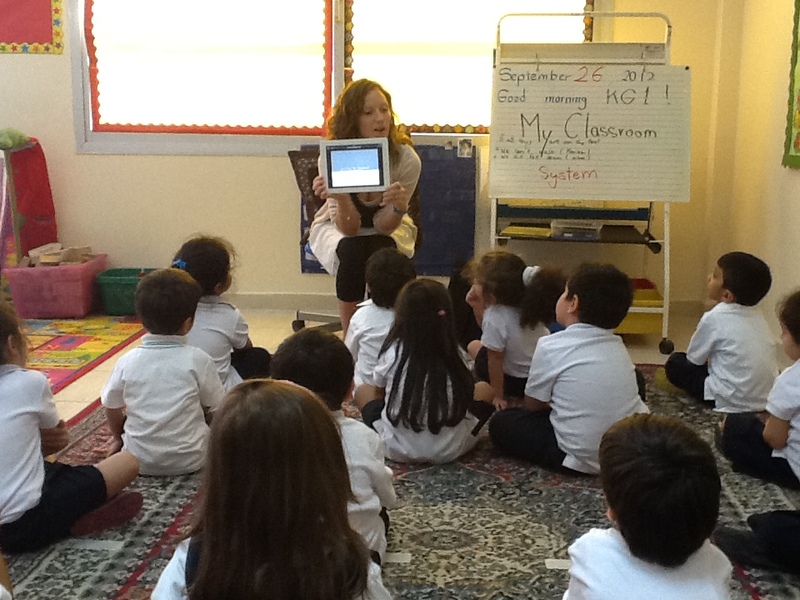 When I took out my iPad to demonstrate some of the things that might make the iPad happy or sad, they were in awe (they literally cooed when I took it out of my bag!). They loved seeing it and were excited to be able to get their own soon. I then let them ask me questions. I quickly saw that there were going to be WAY too many questions in the time we had (the whole lesson lasted about 30 minutes), so I asked them to talk with their table groups in order to come up with 1 question. This was great because they had to work together to pick a question and then also to pick who would ask it. All the credit goes to Matt for this cartoon! Update: Today I walked into a 3rd grade classroom and was told they didn’t have a projector…uh crap?! Luckily I created my book as a Google presentation and have the Google Drive app on my iPad. I had the students gather on the carpet and read them the story on my iPad 🙂 It worked really well…maybe even better than when it’s on a big screen! This is hilarious and amazing. That must have been a detailed process to make it..but you certainly were creative and the kids loved it! With a team paying attention to details like you all are, I’m sure your rollout will be a success!! I found this on Pinterest and love, love, love it! I’m wondering if there’s any chance you’d be willing to share a copy that I could tweak to use in our 1:1 ipad rollout this fall. If not, understandable…thanks so much for the great idea! Hi Kristin! Thank you! You are welcome to use and modify it as long as you follow the Creative Commons Attribution-NonCommercial-ShareAlike 3.0 Unported License. You can download it above in a couple different formats. You can also make a copy in Google Drive using this link. I also adjusted it a little for younger students. I’d love to hear how it goes! Good luck!